After I came home from church today, Boss Man called and told me he had to be out of the yard for awhile. In Boss Man terms, that can mean anything from 30 minutes until sometime later in the week. What he was getting at was that I was going to be responsible for keeping an eye on our herd, which happens to be smack dab in the middle of having calves. No biggie. I’ve watched the cows before. I can handle it. And then he gave me a little reminder, “Keep an eye on 176. She’s off by herself to the east.” In cattleman terms, a heifer off on her own is a sign that she’s probably getting ready to have her first calf. I put my wraps on (long underwear, jeans, heavy socks, t-shirt, sweatshirt, coveralls, jacket, scarf, hat, gloves, Bogs), grabbed my phone and headed out. And quickly realized my mistake. The cow I thought I was watching wasn’t the cow that needed watching. The cow on the west end of the straw, in the midst of all the other cows, was actually the one calving. And by calving, I mean the birth was imminent and I had no time to get her to the barn. 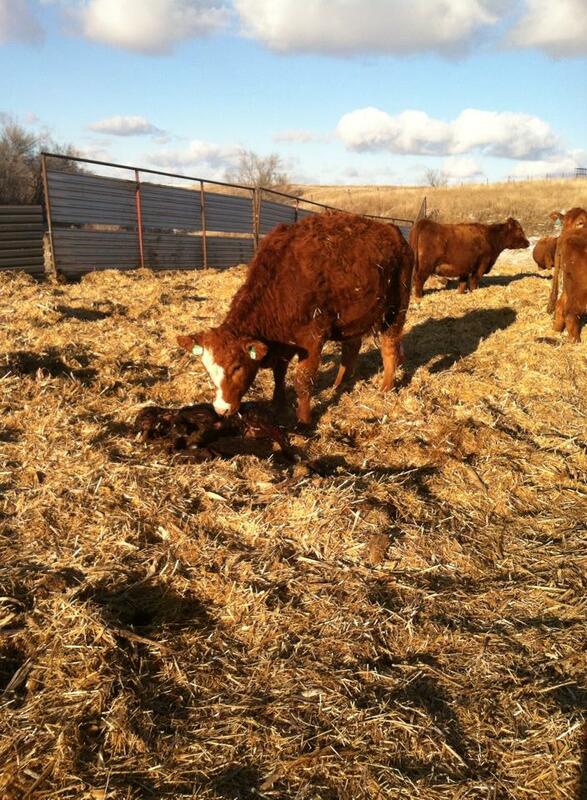 This heifer (which means this was her first calf) ended up having her calf outside. Not ideal with the temps below freezing. This meant I needed to get the new calf to the barn – and the quicker the better. The trick is that sometimes cows don’t want you to take their calves to the barn. 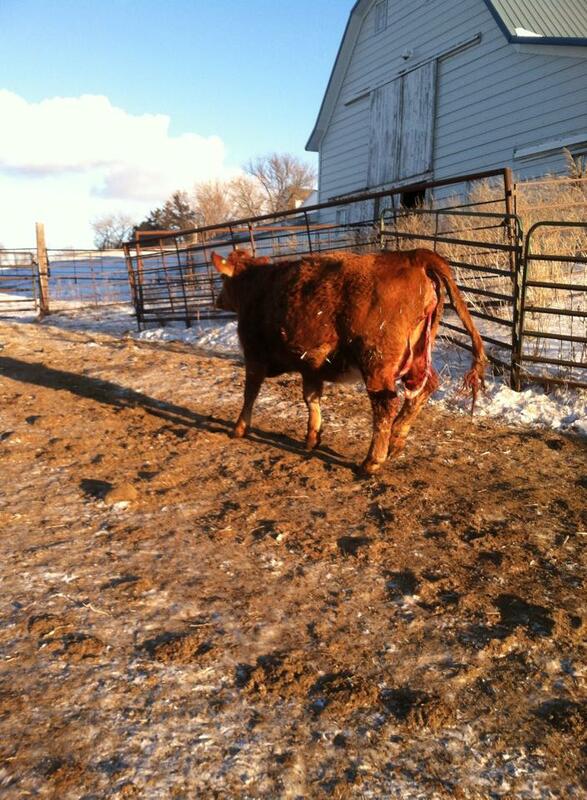 And since this was her first calf, I wasn’t sure how she was going to take the news I was about to break to her. She’s a good mama, which means that she’s protective of her calf. Not always an easy task to get them to the barn. But when it’s only a few degrees outside, you don’t have luxury of time before the calf is at risk for frozen ears or worse. 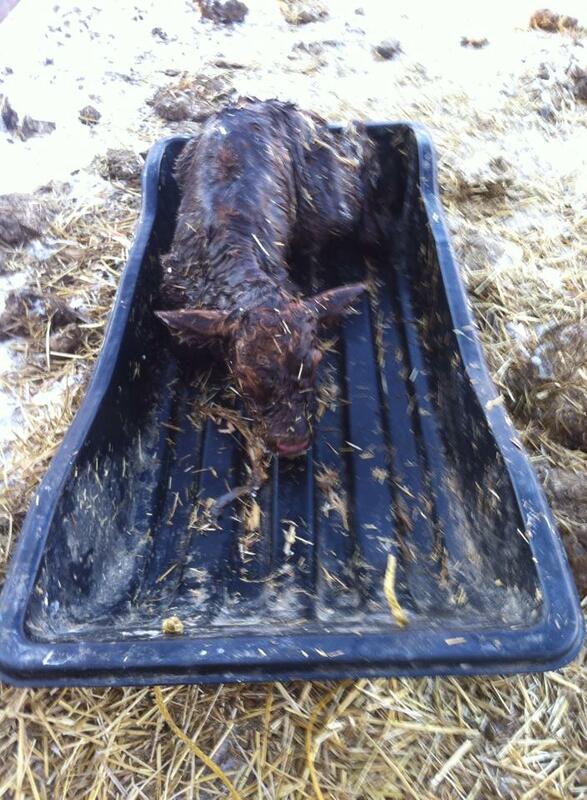 I finally got the calf in the sled. (Thank goodness I’ve dropped a few pounds.) And to the barn. Usually the cow would follow, but this new mama was a bit confused about all the action. So I brought her down once the calf was given a ride to the barn. Thank goodness this little one cooperated…mostly. Imagine dragging a 100-pound child in a sled while they’re trying to stand up. It’s a workout, to say the least. My next job was to bring the heifer down to the barn. Thankfully, she was pretty easy to bring in. And the reunion was a sweet one. Success. 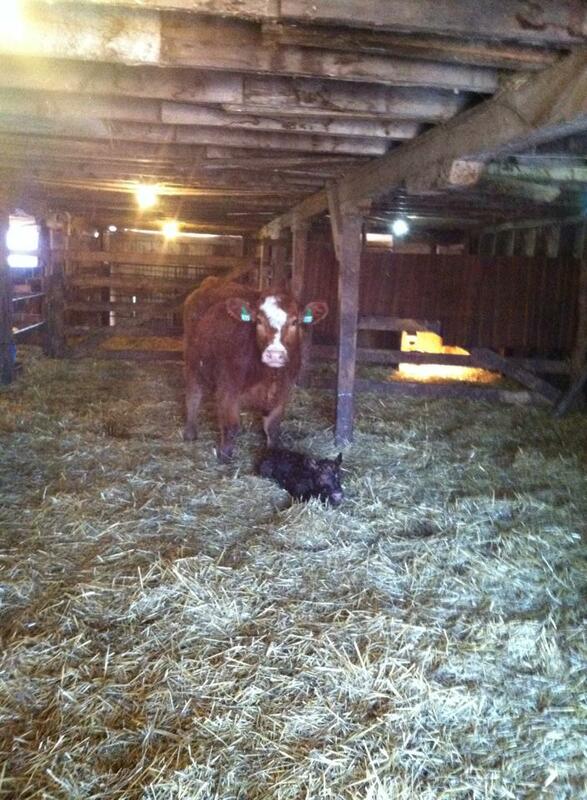 Both in the barn, no injuries, no cold calf, and everyone happy. Last week I was in DC in a suit, I’ll be dressed up tomorrow for work – but today was one of my favorite outfits of all. 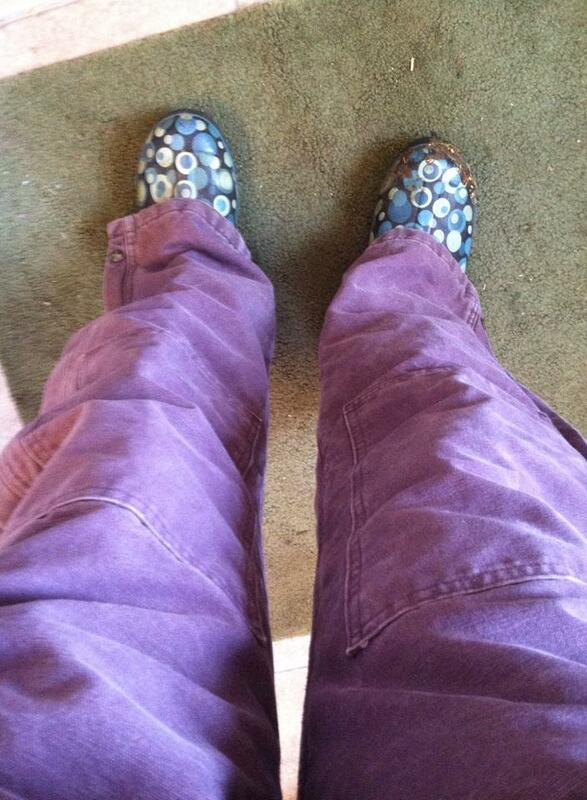 Purple coveralls and blue polka-dot Bogs. I don’t have to worry about one of my boys stealing my cold-weather gear. This entry was posted in agriculture, Agvocacy, animal care, Calving, cold weather calving and tagged agriculture, calving by wagfarms. Bookmark the permalink. Been there done that, great when it all works out. Love the post. When it does work out, you’re right…it’s great. Love the outfit. Never had anything flashy like that, but do remember grovelling about in the mud when a first-calf heifer would decide to have trouble, usually a long way from home out in the corn stalks. I don’t remember the times when the sun was shining, though. Usually, in a storm in the middle of the night. Cold, muddy, tired. I completely understand. Completely. I count my lucky stars that the weather was cooperating. That’s a farm girl for ya! 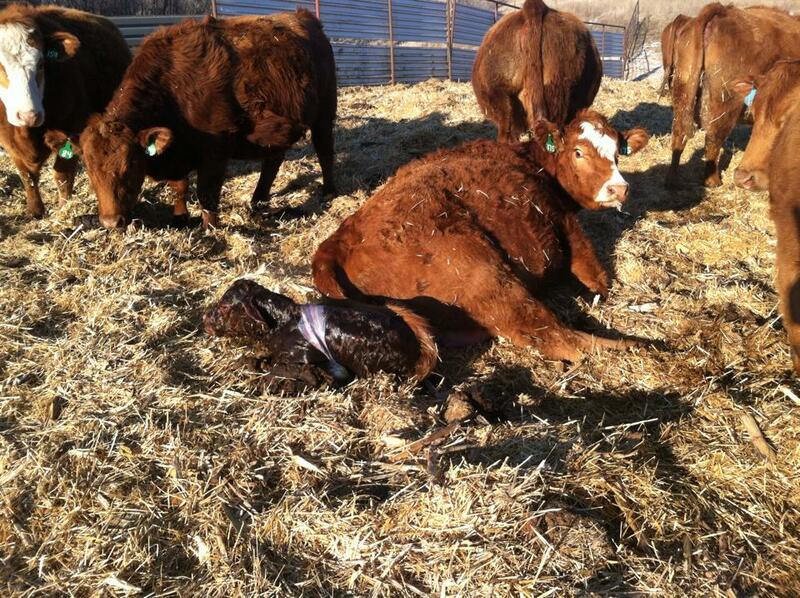 Surely all farm wives have been there, done that ~ quite an experience on top of the privilege of witnessing birth. Your outfit reminds me of when our kids were home and in high school. The boys kept “borrowing” our daughters socks. She put her initial on them with a sharpie ~ didn’t work, one of the boys had the same initial. Her final solution? She drew big flowers on them with several colors of sharpies. Problem solved!